Warm. Inviting. Aesthetically pleasing. Not the standard adjectives used to describe concrete flooring. But thanks to the wide range of materials and technologies now available – and a dash of innovation – drab, gray concrete can be transformed into a thing of beauty. "Over the past couple decades, concrete floors have progressed from garage slabs to highly elegant interior floors and exterior patios and walkways that mimic stone," describes Russell Koontz, owner of Alaska Concrete Creations. Concrete has always outshined other flooring materials for its durability, low maintenance and environmental friendliness. But now, with innovations in coloring and patterns, concrete can be harnessed to resemble almost anything under the sun – from polished marble and tumbled stone, to bricks or wood planks. Paints, Stains and Dyes – Oh My! Concrete floors can be painted, stained and dyed to nearly any color of the rainbow, thanks to a wide range of coloring options. One of the most popular methods to achieve color is through staining, which can be applied to new or old, plain or colored concrete surfaces. The stain penetrates the concrete to produce a permanent opaque or translucent hue. Chemical stains are offered in variations of three basic color groups: black, brown and blue-green. Water-based acrylic stains, however, offer a broader spectrum of shades to choose from. 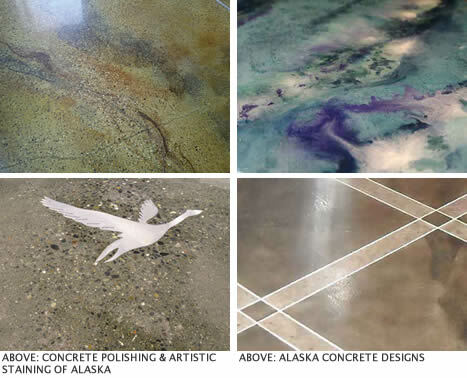 "Stains or dyes can also be blended together to give a natural stone or marble look," describes Jim Vermillion, artist for Concrete Polishing & Artistic Staining of Alaska. "Colors can be made to look almost transparent so you can see the colors underneath, or they can be made a solid color." 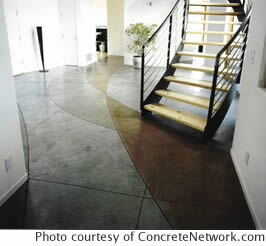 A second option is integral color, which means the concrete is dyed entirely during the initial concrete mixing phase. This can only be used on new concrete, but produces a uniform tone without variations in color. A final option is concrete dye, offering more vivid hues than stains. Dyes are often used to "paint" graphics or artwork directly on the floor. 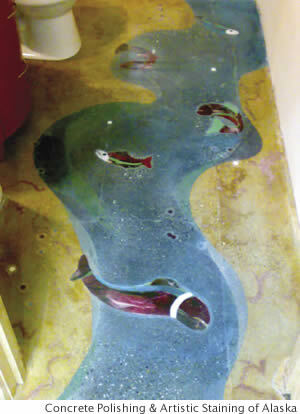 "I've seen a concrete floor where they even stained the throw rugs into the floor," Koontz adds. Homeowners who prefer the appearance of other flooring options but enjoy the benefits of concrete can now have the best of both worlds. 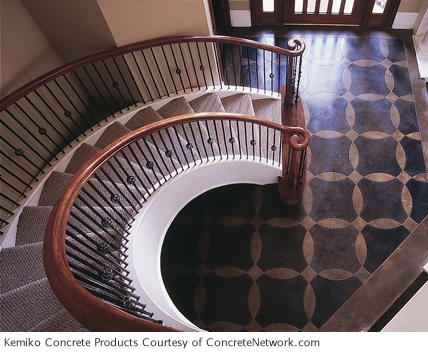 Thanks to cutting tools, stencils and stamps, concrete can mimic the patterns of other floors, such as tile, bond brick, stone or slate. "Patterns can be put into concrete floors using diamond cutting wheels to score in tile patterns or even more contemporary designs," Koontz explains. Koontz reflects on one instance in which a homeowner wanted to mimic large marble tiles in alternating colors to create a checkerboard effect. To accomplish this, he scored pattern lines with a diamond saw in a 3x3-foot pattern. He stained squares alternating colors, then finished it off with a high-gloss clear coat to give the floor the depth of marble. Finally, he used a black tile grout to fill in the scored pattern to accent the tiles. For more elaborate designs, stencils can be used to apply patterns to new or existing concrete. Using a specially formulated paper stencil, patterns can be dyed or stained directly onto the floor without seams or lines. Finally, for a genuine replica of alternative floors, stamps can be used on newly poured concrete to create both the desired pattern and surface texture. "With the use of polyurethane stamps, concrete can be made molded to look like natural slate, sand stone or rough granite," says Koontz. "Also, with the use of these stamps, a wood plank look can also be achieved." Often equated to sanding wood, polishing concrete flooring is a great way to jazz up old or new concrete with added shine. Typically, the process involves using a professional floor grinding system to "sand" the floor down to the desired level of smoothness, followed by a coating of commercial polishing compound applied to the surface. "You will see this application used frequently in commercial applications," explains Regina Daniels, vice president of Davis Block & Concrete, "but now it's being used more in residential applications." Polishing concrete floors produces a shiny surface ideal for homeowners who can't afford marble or granite floors but prefer the same brilliant, mirror-like appearance. The industry also offers a variety of polish products capable of producing different levels of sheen, from matte to glassy appearance. It also enhances light reflectivity, which makes for an environmentally friendly and energy-saving option. Inlay and overlay details can also add depth and interest to concrete flooring. Concrete overlay is typically a mixture of cement, silica or super fine aggregate, and a bonding agent that adheres to existing concrete. "Concrete overlays can be done both vertically and horizontally and can be troweled smooth or sculpted to almost any texture or shape you can imagine," says Koontz. "With the use of concrete overlays textures can easily be mixed and matched." Inlays also can be used to integrate items like aluminum or stainless steel strips into the floor itself. "Intrinsically valuable stones, semi-precious stones, soft metals like brass, copper, zinc or aluminum, glass, wood and hard plastics can all be inlaid for decorative effect," explains Vermillion. One of the greatest misconceptions about interior concrete flooring is that it is cold, an assumption that stems from traditional use of uninsulated concrete slabs that remain close to ground temperature. However, interior concrete insulation paired with radiant heat offer an ideal interior flooring option. "Today, we know enough to insulate below the concrete slab rather than pouring it directly on the ground," explains Vermillion. "With the addition of radiant heat tubes within the concrete slab, the floor becomes toasty warm and lovely for feet." Concrete also offers the ideal medium for transferring heat, because there is no insulating barrier between the concrete and your feet. Innovations in concrete flooring have opened the door to self-expression through the use of technology, color, texture and design. "Concrete is the one medium for flooring that you can truly say 'you are only limited to your imagination,' " says Koontz.